The sockets and attachments in this 67 piece 1/2" drive 6 point SAE set feature outstanding corrosion resistance as a result of our proprietary in-house plating process. Each socket is made from premium tool steel for maximum durability and has a distinct brilliant jewellery-like finish. The included high torque ratchet features a closed back which reduces potential ratchet mechanism damage from dirt and debris. Made in Canada and backed by Gray Tools worry-free lifetime warranty. 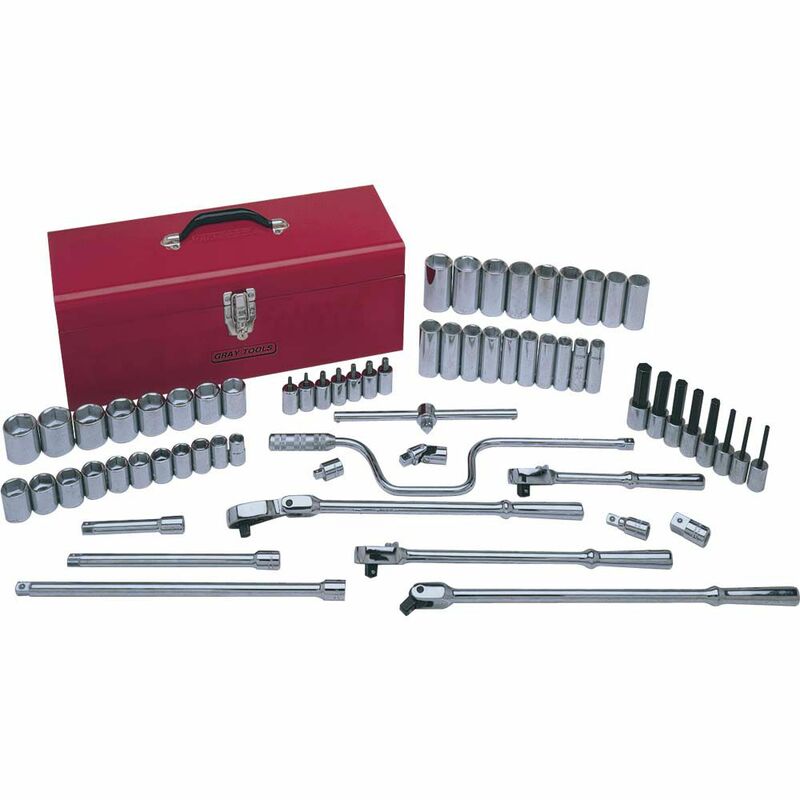 Contains: Hand Box, 19PC Socket Set, 1/2" Female to 3/8" Male Adapter, 1/2" Female to 3/4" Male Adapter, 18" Flexible Handle, 19" Speeder, 11" Sliding T-handle, 2-1/2" Universal Handle, 2", 5" 10" & 15" Extension, 10" & 15" Reversible Ratchet, 14-1/2" Flexible Handle Ratchet, 8PC Hex Head Socket Set, 19PC Deep Socket and 7PC Torx<sup>®</sup> Socket Set. The Dual-Pawl technology of the New Husky 100-Position 1/2 in. drive ratchet provides access to turn fasteners where other ratchets can't with its ultra-narrow 3.6 arch swing. It's 10% longer handle allows for increased reach to access hard to reach fasteners and improves overall leverage. The Industrial-grade black finish gives the tool a sleek look while adding durability and corrosion prevention. 1/2 in. Full-Polish Ratchet is made of chrome vanadium steel to provide excellent durability, and the chrome finish resists corrosion and cleans easily. This ratchet has a 1/2 in. drive and a teardrop-style head with a low profile to allow for excellent access to nuts and bolts in tight locations. Socket & Attachments Set 67 Pieces 1/2 Inch Drive 6 Point Standard Sae The sockets and attachments in this 67 piece 1/2" drive 6 point SAE set feature outstanding corrosion resistance as a result of our proprietary in-house plating process. Each socket is made from premium tool steel for maximum durability and has a distinct brilliant jewellery-like finish. The included high torque ratchet features a closed back which reduces potential ratchet mechanism damage from dirt and debris. Made in Canada and backed by Gray Tools worry-free lifetime warranty.